Yes YEEEESS! The complete Zim collection is finally MIIIIINEE!! Now I have the resources to bring DOOM to the DOOMED souls that stand in my path of DOOM! Ahem. I ordered this already. The cool part about it is that if you already own the other DVD's you can just order the box with the extra disk. So many publishers come out with a collection once all the DVD's are out that I waited. Guess I didn't need to. Super cool. 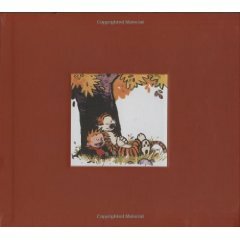 The Complete Calvin and Hobbes is also here. Finally. I've been so confused trying to collect them, they're not numbered and there is a lot of redundancy with the other collection books out there. 3 paperback (archive quality?) volumes of every C&H comic ever made, each with a number so you know what and when you're reading.